. Constructed of 2" heavy wall steel tubing. Pads are constructed of 2.5" high density foam with Black marine grade vinyl . 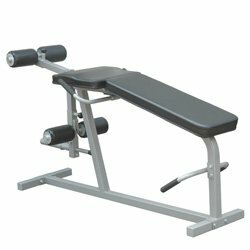 Ideal for complete leg conditioning and strengthening of knee, thighs and hamstrings. . Features special split pad that allows for the proper isolation of the muscles. . Can be used for leg extension exercises in the sit-up position and leg curls in the prone position . 38"H x 24"W x 80"L - 110 lbs..